The Frederator Studios Blog: Frederator Studios Locations. Postcards, Series 5. Frederator Studios Locations. Postcards, Series 5. 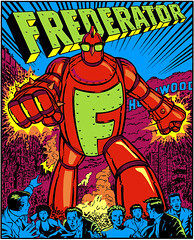 Frederator's been in a lot of locations since we set up shop in the late 90s. Originally we were based in Hollywood, home of all good cartoons. So, what better image for a Southern Californian animation studio than an old McDonald's storefront? People could drive up, order a few drawings or walk cycles, and be on their way in no time. When headquarters relocated to New York, we found ourselves missing the venerable Hanna-Barbera building where we started in 1992. After all, it's the most famous studio in the history of television cartoons, and the place we were able to develop our approach, the place where we launched Dexter's Laboratory, The Powerpuff Girls, Cow & Chicken, and a bunch of other hits. The fastest route to comfort? Re-creating that googie HB complex at 253 Fifth Avenue, where we stayed until we outgrew it at the end of 2004. Incidentially, by my count, we've now sent out 33 postcards in Series 5. That leaves a few over 40 to go.